I’d seen stills from this show and some of Yas’ typically excellent artwork here and there for years, but I’d never thought it was anything more than some illustrations, maybe a children’s book or two. 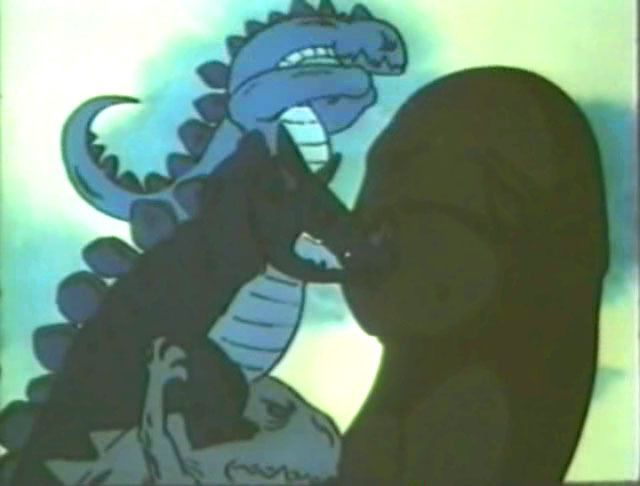 I certainly didn’t think it was a Nippon Sunrise series produced in 1975 that ran for 26 episodes, and was not only a success in most of Europe, but was dubbed into English by Paramount and became an integral part of the TV childhoods of kids in Australia and England. America, however, was bereft of KUM KUM. We had to satisfy our prehistoric desires with LAND OF THE LOST and KORG, 70,000 BC and VALLEY OF THE DINOSAURS and CAPTAIN CAVEMAN. Okay, that last one, not so much. WANPAKU (“naughty”) OMUKASHI (“ancient”) KUM KUM is a fun little series, a prehistoric children’s adventure show that freely mixes comedy, action, myths and facts but remains firmly grounded in the day to day lives of the Mountain Folk, a tribal people just on the cusp of civilization. Kum Kum lives while mankind transitions from being hunter-gathering wanderers to becoming a agricultural, settled, animal-domesticating language-developing society. The Mountain Folk have learned to plow and plant, but still do a lot of gathering. The Wise One has writing, but only he can read it. Occasional travelers demonstrate things like wheels, wagons, and war; but the Mountain Folk still make do with hunting and fishing. A rudimentary religion is demonstrated by Dark Eyes, the resident fortune-teller and soothsayer, who also demonstrates that this level of civilization possesses sophisticated hairpiece technology. Our hero Kum Kum isn’t a BAD kid, just curious, mischievous, impulsive, sometimes unthinking, occasionally vindictive. Sure, those ingredients sometimes add up to “bad”, but when he crosses the line, the Wood Cave is always waiting. That’s where we find Kum Kum when the show opens, waiting out yet another stretch of hard time as a result of yet another prehistoric escapade. Kum Kum’s world is a fun place to be a kid; plenty of forests and mountains to roam through, animals to chase, fish to catch, and friends to tease. Kum Kum’s gang – Butterfly (Chiru Chiru) , Little Rock (Aaron), and Bumbles (Mochi Mochi) run roughshod through the little Mountain Folk tribe, causing no end of headaches to Kum Kum’s dad Strongarm ((Paru-Paru), mom Flora (Malu-Malu), toddler brother Tum Tum and teenage sister Wildflower (Furu). Wildflower is smitten with the Wise One’s son Roman who lives up to his name by roaming far and wide across the unknown prehistoric landscape. Roman roams because his home life is mostly occupied by arguing with his hairy, pipe-smoking father, whose original Japanese name is “Kuropedia.” In spite of courtship attempts made by Little Rock’s enormous, slightly slow brother Jumbo (Goron) and Roman’s temptation to join the Nomad tribe and marry Rose, - not to mention opposition from both Strongarm and the Wise One - true love triumphs and Wildflower and Roman are (SPOILER!) married in the final episode. Just a few things keep KUM KUM from being an animated, archeologically approved version of one of those natural history museum dioramas; one is the dinosaur that lives in the lake, and the other are the Cheeky-Squeakies. Saurus is the dinosaur; this old and amiable Apatosaurus is possibly the last surviving dinosaur. He’s happy to chew his cud in the lake and occasionally act as a giant playmate for the children. Sure, we all know that dinosaurs and human beings were separated by a few million years, but here at KUM KUM scientific rigor takes a back seat to cartoon fun. However, the Cheeky-Squeakies (“Pyonki” in Japanese) have no analog in the fossil record. These bouncy, big-eyed little mascots hop all over the countryside and give the children something to chase in idle moments. Occasionally they catch some, harness them up, and go skiing over the tall grass. 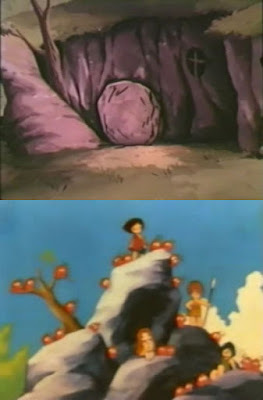 We learn in a very special episode that the Cheeky-Squeakies are vastly older than man, have a language and a culture, and occasionally go to war with each other underground in ritualized combat that recalls the classic Uncle Scrooge story “The Land Beneath The Ground”, though unlike the struggle between the Terries and the Fermies, the Cheeky-Squeaky war does not cause earthquakes. It’s pretty clear that this prehistoric land is supposed to be Japan. We’re treated to establishing shots of blossoming cherry trees, the volcanic nature of the land is remarked upon in several episodes, and we even get to see monkeys enjoying hot springs and an instance of the Japanese folk belief that fish can predict earthquakes. But the question of whether or not Kum Kum's people represent the Jomon culture will have to be answered by more knowledgeable archeologists. The English language dub firmly presents Bumbles as a male, but I’m not convinced that Mochi Mochi isn’t a girl, a gangly, Big Ethel sort of gal. The female Japanese voice actress and the hair bow may be circumstantial evidence, but it wouldn’t be the first time a character’s gender was switched in the localization. The English voice is a hoarse goofball intonation that could go either way. And let’s face it, these are six and seven year old kids, gender is pretty much academic at this point. 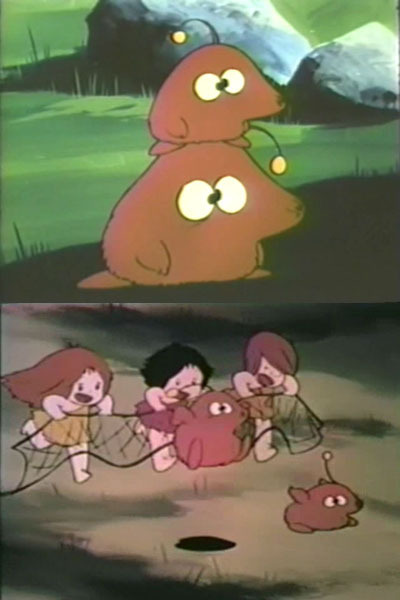 KUM KUM was produced by Banjiro Uemera, who would later produce the fine Star Wars ripoff MESSAGE FROM SPACE. In his capacity as head of ITC Japan, he was responsible for 1982’s sf actioner TECHNOVOYAGER, otherwise known as THUNDERBIRDS 2086. He also produced the When Animals Attack film ROAR, starring Tippi Hedren and her animal friends (and daughter Melanie Griffith). Interestingly enough the show is an early directorial attempt by Rin “Shigeyuki Hayashi” Taro, who would go on to work for Toei and direct SPACE PIRATE CAPTAIN HARLOCK, the two GALAXY EXPRESS MOVIES, and from there to direct HARMAGEDDON, DAGGER OF KAMUI, METROPOLIS, X, DOOMED MEGALOPOLIS, PHOENIX, and other anime works. But the primary creator behind KUM KUM is obvious from even the most casual glance; the distinctive art style of Yoshikazu “Yas.” Yasuhiko. 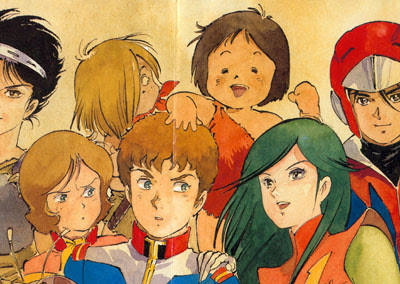 Yas.’ CV includes MOBILE SUIT GUNDAM, BRAVE RAIDEEN, DIRTY PAIR, VENUS WARS, ARION, GIANT GORG – Yasuhiko’s classy linework and graceful characters are an unmistakable hallmark of the classic era of Japanese animation. KUM KUM’s Yas. character designs are front and center; Kum Kum and his pals wouldn’t be out of place roaming the corridors of White Base as refugees from Side Whatever, and the flowing robes, bearded giants, and vital natural landscape would return in works as diverse as GORG and ARION. What makes KUM KUM so fascinating, for me anyway, is that I’m a guy who spends way too much time thinking about Japanese cartoons (obviously). Have been this way for years. And yet here’s a show with a pretty impressive pedigree (Yas, Rin Taro) that not only had I never heard of, but that had been dubbed into English and shown around the world, to boot! It just goes to show, the more you know, the more you realize there’s yet to learn. Why did KUM KUM never make the transition to American television? 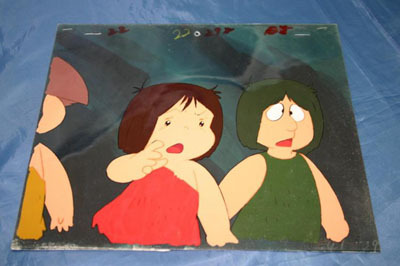 One reason leaps to mind: prehistoric children don’t wear pants. So the next time you’re thinking darkly of American exceptionalism, remember that sometimes Uncle Sam is, like Kum Kum, still trapped in the dark of the Wood Cave, waiting to be set free. At Anime North a few weeks ago my wife spotted something groovy in the dealers room. No, not glomping crossdressing furry cosplayers – but something that was actually related to Japanese cartoons! Namely, a set of buttons from Albator. You know, Albator! The French language version of Toei’s 1978 Captain Harlock series, broadcast to the Francophone world in the late 1970s. 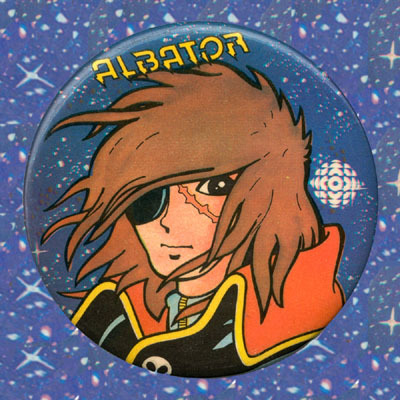 Albator, whose name was changed from “Captain Harlock” because, as the story goes, the French localizers were afraid children would confuse the character with “Captain Haddock” from the popular Belgian comic Tintin. Because the characters are so much alike! There isn't a similar story to explain why every other character in Captain Harlock got his or her name changed, nor why all the music was thrown out in favor of vastly inferior replacements. At any rate the buttons are pretty cool. 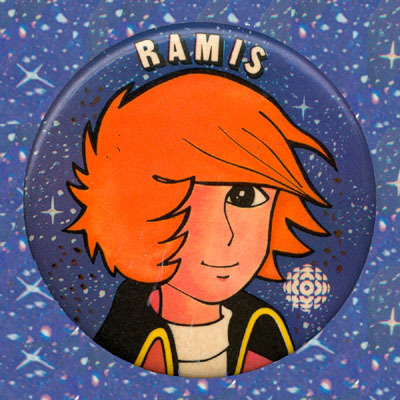 Not just because Tadashi Daiba – sorry, “Ramis” - is clearly missing an eye, or the general sloppy fan art vibe of the artwork, but mostly for the 70s era CBC logo plastered onto the images. 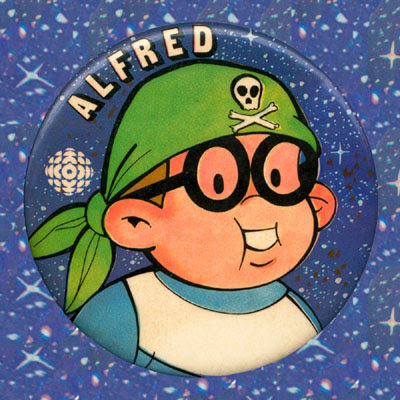 Albator was broadcast on the French-language CBC – sorry, “Radio-Canada Television”- starting in 1979, and along with other French-language anime hits like Goldorak, Candy Candy, and Le Roi Leo, gave the Francophone Canadian anime fan a distinct advantage over the Anglophone Canucks, who were forced to make do with Star Blazers and Force Five on Buffalo UHF stations. You might notice that one of these characters is not like the others. Sure, Captain Future, the '78 Toei series based on the pulp series by Edmond Hamilton, was popular in Europe, where he was known as "Capitane Flam". 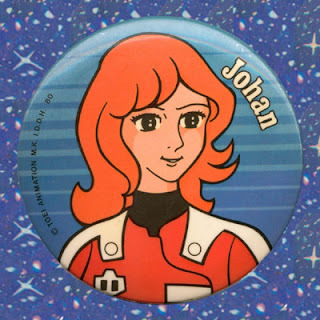 However, how a button of Captain Future’s girlfriend “beautiful Joan Randall” wound up with some Albator badges is anybody’s guess. You know those Japanese cartoons, they all look the same. And the character's slight name change only proves the Electric Company's hypothesis that a Joan can become a “Johan” merely by adding our good friend “silent h”.